We believe successful Liability-Driven Investing (LDI) portfolio management requires a comprehensive knowledge of actuarial sciences as well as a deep understanding of financial markets. 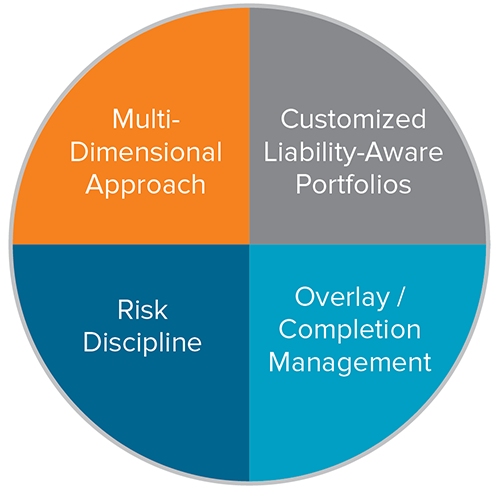 This belief explains our multi-dimensional approach to LDI that combines a Liability Strategy Development team with a team of experienced portfolio managers. For more information, please contact VoyaIMLDISolutions@voya.com. Voya offers plan sponsors a full suite of pension risk management solutions — from off-the-shelf strategies benchmarked to traditional market-based indices, to bespoke liability-matching portfolios with interest rate overlays. Our Liability Strategy team partners with clients to evaluate current plan conditions as well as end-state goals and objectives to develop and recommend strategies appropriate to achieve the desired objectives while balancing risk and return within the established risk profile of each client. Voya's LDI Strategy Development team partners with clients to develop solutions to help solve key challenges for plan sponsors. Read more about our customized approach to diagnostic reporting. * Representative allocations; actual portfolios may vary.